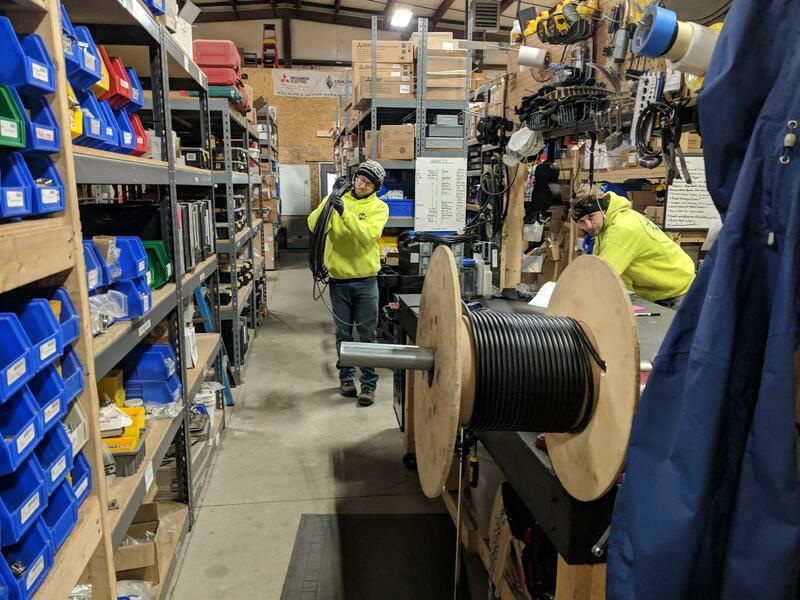 Solar installation workers unspool wire at ReVision Energy’s Brentwood warehouse. Their state certifications could get those electricians into all kinds of jobs at home and beyond. But ReVision’s operations director James Hasselbeck hopes their New Hampshire graduates choose to work here, in solar. “We’re providing these folks opportunities to stay within the state and make a good wage without racking up tens of thousands of dollars in college loans,” he said during an open house with lawmakers and prospective workers at Revision’s Brentwood warehouse Wednesday. ReVision market development director Dan Weeks says they want to help new, young workers join New Hampshire's aging, shrinking workforce, while combating climate change. Weeks also credits years of climate change-focused policies in states like Massachusetts and Vermont with driving those states’ solar growth, which has far outstripped New Hampshire’s. A handful of current and incoming state legislators, who will be part of a Democratic majority in Concord, were in attendance at the open house. They say they want a diverse renewable energy portfolio, and they plan to support exploration of offshore wind development in New Hampshire as part of that. But state Sen. Martha Fuller Clark, a Democrat from Portsmouth, calls solar the state’s best chance to capitalize on growth in renewable energy while cutting carbon emissions. She says she and her colleagues will prioritize policies to support those goals next session – starting by reviving a bill to expand the state’s net metering program, which Gov. Chris Sununu vetoed this year. Legislators narrowly declined to overturn that veto. State Sen.-elect Tom Sherman is a Democrat who will represent the southeastern corner of the state. He says he’s confident the new legislature can work with Sununu to pass clean energy policies. Sununu has said in the past that he supports renewable energy when it can compete on its own merits. He has also said he does not support new subsidies or other policies that could raise rates for consumers – for any kind of fuel. Regulators have finished a big review of the state’s renewable portfolio standard, and they say it’s working as planned. The legislature first enacted the RPS about 10 years ago. New Hampshire’s is one of many around the country. It requires utilities to ramp up their investment in and use of renewable energy -- including wind, solar, biomass and hydropower -- with a goal of making the state's fuel mix 25.2 percent renewable by 2025.